Story: Ray Romano, John Leguizamo and Denis Leary return to voice our three heroes: Manny, Sid, and Diego. Our trio is still together and enjoying the perks of their now melting world. Manny may be ready to start a family, but nobody has seen another mammoth for a long time; Manny thinks he may be the last one. That is, until he miraculously finds Ellie (voiced by Queen Latifah), the only female mammoth left in the world. Their only problems: They can't stand each other - and Ellie somehow thinks she's a possum! Ellie comes with some excess baggage in the form of her two possum "brothers" ...Crash and Eddie (voiced by Seann William Scott and Josh Peck), a couple of daredevil pranksters and cocky, loud-mouthed troublemakers. 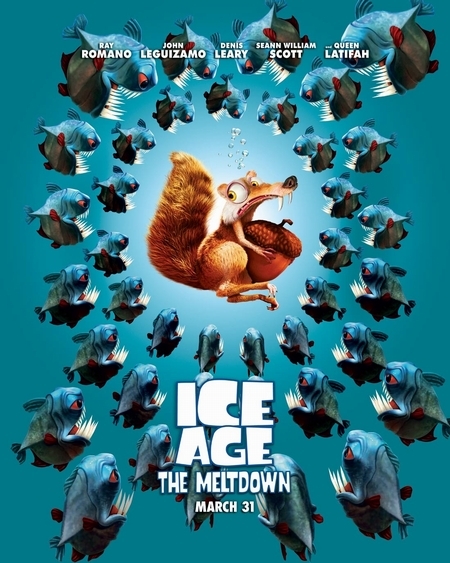 Manny, Sid, and Diego quickly learn that the warming climate has one major drawback: A huge glacial dam holding off oceans of water is about to break, threatening the entire valley. The only chance of survival lies at the other end of the valley. So our three heroes, along with Ellie, Crash and Eddie, form the most unlikely family -- in any "Age" -- as they embark on a mission across an ever-changing, increasingly dangerous landscape towards their salvation.